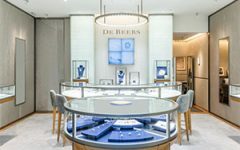 The Jewelers For Children fund–the jewelry industry’s one and only national charity–donated $3.825 million on Sunday to organizations that help chronically ill youngsters. That is the largest annual amount yet raised by the JFC. It is 11% higher than the 2003 contribution, composed of various donations and contributions made by individuals and organizations in the industry. The presentation to the Make-A-Wish Foundation, the Elizabeth Glazer Pediatric Research Network, St. Jude’s Childrens Research Hospital and the National CASA (Court-Appointed Special Advocates) Association was made at JFC’s annual “Facets of Hope” gala dinner, hled this year at The Bellagio Hotel in Las Vegas during 2004 international JCK Show. The annual gala celebrates JCF’s year-long fundraising efforts by those who create and sell jewelry. In the past six years, the JFC gala has raised some $14 million for the children’s charities supported by the industry, says JFC executive director Patty Light. The 2004 gala’s guests of honor were Fred Dayoob, of Fred Meyers Jewelers, and Susan Jacques, of Borsheim’s. In addition, to the dinner, JCF held a raffle and a live auction. The raffle starred 25 Swiss-made luxury watches—including a $14,000 timepiece by luxury jeweler/watchmaker Harry Winston—donated by the prestigious watchmakers in the show’s Swiss Watch Gallery by JCK in The Venetian Hotel. During the live auction, two “Diamond Diva” portraits, donated by the Kwiat Co., were sold at a live auction following the JFC Gala. Each features a legendary film star portrayed in a portrait composed of 500 cts. of diamonds on black velvet. The portraits are part of a set commissioned by Kwiat for display in its business suites at high-profile media events, such as this year’s Academy Awards. For more information about the Jewelers for Children charity and what stores and individuals can do to participate year round, call (516) 744-3222 or go e-mail plight@jewelerscharityfund.org.